Want to hear a first world problem? The other night I wanted soup, but I didn’t want soupy-soup. I wanted something….chunkier. 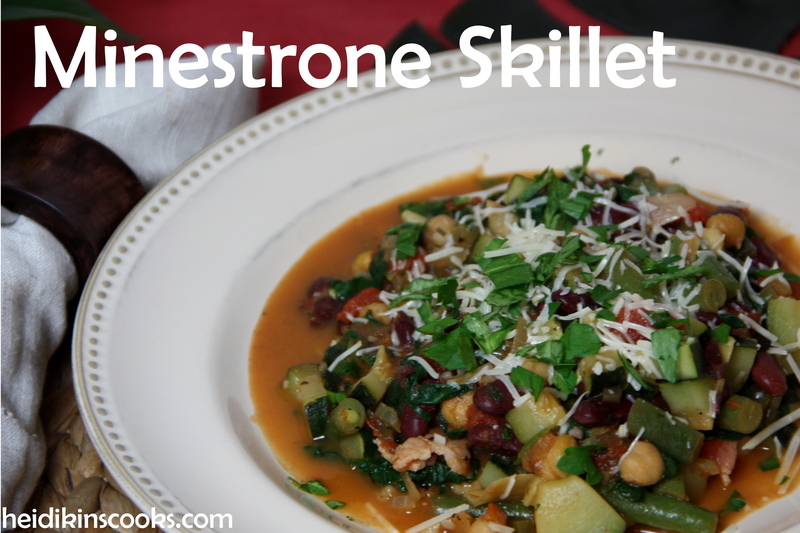 I was flipping through my recipes and the Minestrone one caught my eye, but again, I didn’t want something soupy, or brothy, or anything that required a spoon. I wanted fork-worthy soup. Stew? Yes, stew. But not meaty, I wanted thick, vegetabley fork-required stew. (Oh my gosh, are you still reading this? I can’t even explain myself sometimes!) The solution, of course, is a dinner skillet, a one-pan meal for all my vegetabley wants and needs, with just enough broth to steam and cook the veggies but not enough to need a spoon. This is, perhaps, one of the most delicious things I’ve made in a while. It’s packed full of veggies, and the combination of fresh green beans and spicy parsley made this taste so fresh and swoony! Swoony forky stew, please! Heat a large skillet or frying pan, toss in the chopped bacon and cook until crispy. Add onion, garlic, celery, and pepper and stir, throw in salt, pepper, and other spices and continue to stir until the veggies are soft and translucent. Add the green beans, tomatoes, kidney beans, chickpeas, zucchini, and broth and bring to a boil and simmer covered for 10-15 minutes until your green beans are cooked but still a tiny bit crisp. Take the lid off–your skillet should be awfully full by now–throw all the spinach on top, and put the lid back on for 3-5 minutes, until the spinach is wilty,then stir it in. Test for salt and pepper, add more if necessary. Serve hot, topped with Parmesan and parsley, and a side of crusty bread smothered in butter. Serves 4-6 adults. I served this in a deep plate and it worked perfectly, if your plates are kind of flat you may prefer a bowl instead. You can easily add cooked chicken or turkey or diced up pork to this to bulk it up a bit. Or add some chopped up or shredded carrots, or mushrooms, or small pasta (I’d throw it in cooked, not raw), or kale, or anything else that suits your fancy. There are probably endless variations on this recipe!